Understanding the Biological Health of your septic system and how to maintain it! Septic Systems start out as Aerobic and Non-Aerobic Bacteria based systems (aerobic means the bacteria need air to live and non aerobic means without air). Regular care of your system includes inspections and pumping every two years. It’s very important that the tank be pumped as well as the distribution box, drywell or cesspool. It is as equally important that you inspect the tank for cracks or missing baffles (baffles prevent solids from entering the drainage structures). Other drainage structures such as drain lines, leach lines, drywells and cesspools should also be inspected for debris, cracks or other structural defects. I'd like to go above and beyond for you here and take a moment to educate you quickly on how your septic system actually works, or rather how it was meant to work when originally installed, and a solution for when you suspect septic drain field failure. Without this "quick tutorial," fixing your failing septic system, or any other septic problem, may be like trying to piece together a puzzle without the puzzle picture on the outside of the box..! 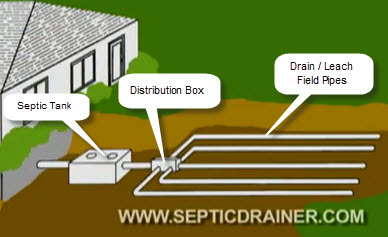 Below are three different types of septic systems that treat household sewage. Septic Drainer may be used for septic drain field problems in any of these systems, which includes conventional septic, dry well septic and cesspool. *Note: An easy way to find out what type of septic system you have is by contacting your septic professional or your local county department of records. Most municipalities keep records showing building plans for systems installed after the 1970s’. Solids settle on the bottom of the tank, and less dense materials, such as grease, oils and soap, float to the top. The liquid in the middle of the tank or wastewater flows out into a distribution box, which distributes the water into the septic drain field. Baffles prevent grease, oil and soap from escaping into the septic drain field. The septic drain field is a series of trenches lined with perforated pipes, covered by soil.The wastewater passes through holes in the pipes and leaches into the drain field soil, which acts as a natural filter. The liquid in the middle of the tank ("wastewater") flows under baffles that prevent soap and grease from entering the septic drywell. The wastewater flows via a pipe into the drywell, usually a tall concrete cylinder that has holes in the side and an open bottom, covered in soil. The wastewater then seeps out into the surrounding soil, which filters the effluent. Wastewater flows from the home or business into a cesspool septic tank. The tank is a hole lined with stone or concrete to form a pit into which sewage is discharged. Solids settle on the bottom of the tank, and liquids remain on top. Wastewater is absorbed into the soil of the septic drain field, from both below and through the sides of the cesspool. This Septic Drain Field Problem Today..! 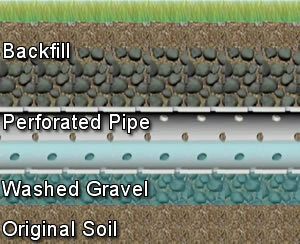 -- On average, a drain/leach field consists of a series of pipes buried 18" within the ground on top of a bed of gravel. These drainage pipes sit parallel with one other and are all linked together coming out of the distribution box. Liquefied sewage moves through the system under the weight of gravity from the septic tank, through the distribution box and into each of the drainage pipes. On most new septic system constructions, the opposite end (the very end) of the drain pipes are tied together and vented above the ground. A functioning Drain/Leach field will dispose of house hold waste water by draining the liquefied sewage through many small weep holes (in the drain field pipes) into the dry subsoil under the system. As you have previously learned, after the liquefied sewage drains away from these pipes, if it is filtered by 36 inches of dry soil (colonized with aerobic bacteria), it will again become clean ground water. Most townships base a Drain / Leach field size by adding 500' of drainage pipe for each bedroom in the home. Currently, Septic Installers place a drain around the outside of the drain/leach field area to remove excess ground water. The idea behind this 'Curtain Drain' is to remove built up water to allow the liquefied sewage to drain/filter through the necessary 36" of dry soil. When ground water builds up under a drain/leach field, dark liquefied sewage will float to the top and cause a foul 'septic' odor. This is referred to as a 'Glazed' drain/leach field and as you can imagine: Not only is this more common with older drain/leach fields, but this is also considered a failure that is dangerous and must be repaired. Leach field maintenance is very important to the proper functioning of your system. Depending on the number of bedrooms, a septic tank (holding tank) can range in size from 500 to 3,000+ gallons (1000 gallons being average). Your Septic Tank is setup to only allow liquid to pass through to the drain / leach field in order not to clog the small weep holes and dry soil with suspended solids. This task is performed through microbial digestion and seperation. 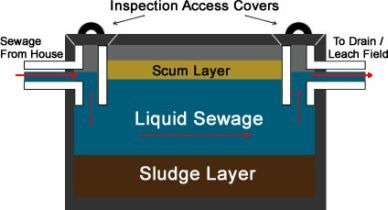 Within your septic tank, denser solids sink to the bottom and form 'sludge' while the lighter solids, such as oil & grease, move to the top and form what is known as the 'scum layer'. Between these 'upper and lower' layers should be all liquid. Inside your septic tank there are a series of baffles. These baffles work to keep the scum layer held at the top & the solids pooled at the bottom. The only other thing you really need to note is that your septic tank turns solids into liquid through the process of "Microbial Digestion". Sludge & Scum is liquefied by natural enzymes & bacteria within your septic tank. This same process is used at municipal waste water treatment plants all throughout the country. After 'Microbial Digestion' occurs, all the liquefied sewage flows out of the septic tank and into the 'Leaching Area' (Drain / Leach Field). Once in the Septic Tank, gravity then causes the liquefied sewage to flow to a small box known as the 'Distribution Box'. By running liquefied sewage into this one box that has multiple out-pipes, you can spread the waste water evenly across your entire drain / leach field. Once the waste water has entered the drain / leach field it then leaks out of small weep holes in the bottom of the drain field pipes. After making its way out of these drain pipes, the waste water is then naturally filtered through dry soil until it once again becomes clean ground water. And that's it..! As you can see there's really not a whole lot to to the process. Waste water (sewage) drains from your home into your Septic Tank. 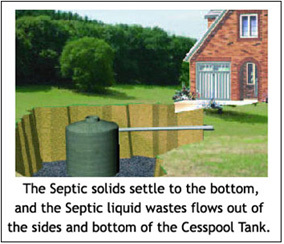 Your Septic Tank turns solids into liquid through 'Microbial Digestion'. Baffles in your septic tank separate and only allow liquids to flow out. 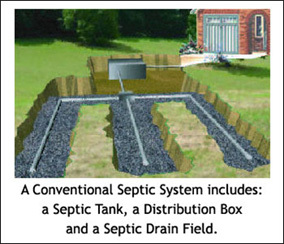 Liquid Sewage flows from your Septic Tank to your 'Distribution Box'. In the distribution box, waste water flows evenly into your Drain Field Pipes. Where it then drains from small weep holes in the drain field pipes deep into the ground. After the liquefied sewage (waste water) has filtered through 36 inches of bacteria colonized soil, it once again becomes clean ground water. Now That You Know 'How' Your Septic System Works... Would You Like To Know Why Septic Systems Fail & How You Can Easily Restore Your Failing System Without Spending Thousands Of Dollars In Repairs..!? Bio-Septic Boost was designed to stimulate biological activity. Copyright (c) 2013 Bio-Septic Boost. All rights reserved.